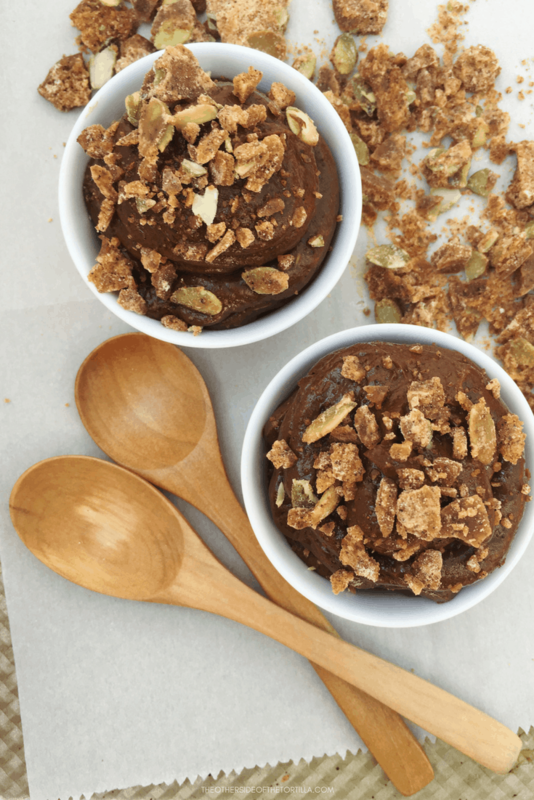 Avocados blended with raw cacao powder and honey make for a perfectly silky, decadent, and dairy-free chocolate pudding. Most chocolate pudding recipes use milk, along with cornstarch and sometimes egg yolks to thicken it. 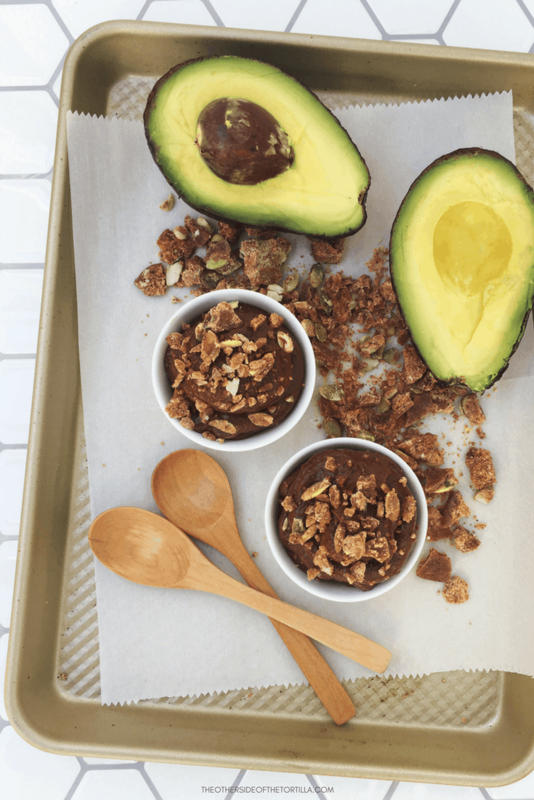 This avocado chocolate pudding recipe relies on the creamy texture and stability of avocado and gelatin to create that perfect pudding texture. 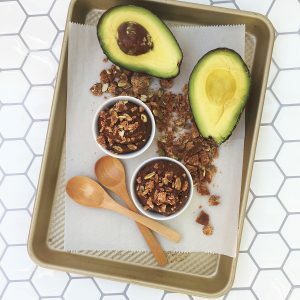 If you’ve got avocados that are slightly past their prime and a little too soft for anything else, this recipe is a great way to use them up so they don’t go to waste. I have a lot of lactose-intolerant and dairy-free people in my life (and I’m lactose-intolerant myself), so I wanted to make a really good chocolate pudding that we could all enjoy without tummy trouble. I’ve made other avocado puddings over the years, but with sweetened condensed milk. I like this version a little bit better because it’s slightly less sweet, but just as rich in the chocolatey taste. It’s not the same thing as regular cocoa powder you find in the baking aisle at every grocery store. Raw cacao powder is made with cocoa beans that have been cold-pressed (not roasted), which preserves the living enzymes from the bean but removes the fat. You’re left with a more nutritious result. Regular cocoa powder, on the other hand, is made by roasting the beans at high temperatures. Dutch-process cocoa, which you might already have in your cabinet, is “washed” with a potassium carbonate solution to neutralize the cocoa’s acidity, and it has a darker hue and more mellow flavor. These are three different forms of cocoa powder that don’t taste the same. I use a brand called Sunfood Organic Raw Cacao Powder that I buy on Amazon (prime shipping for the win) because it’s cheaper than buying it from WholeFoods, which is the only nationwide grocery store I’ve found that consistently carries it. I also use Nielsen-Massey pure Mexican vanilla extract (never imitation!) that I also buy on Amazon. It’s really important that you do not substitute regular cocoa powder meant for baking or Dutch-process cocoa powder; the end result will NOT taste the same. I’ve included a quick and easy recipe for a pepita-ancho chile sugar crackle topping for some additional crunch, but you can leave that out if you’re just looking to get a chocolate pudding fix. Or, you can also try my avocado fudge popsicles. Creamy avocado gives richness and a silky texture to this dairy-free chocolate pudding. In a small prep dish, add 1 1/2 teaspoons Mexican vanilla extract and 1 1/2 tablespoons cold water. Sprinkle 2 teaspoons unflavored gelatin over the liquid mixture and allow it to sit for about a minute. In a small food processor or blender, add the flesh of 1 1/2 medium or large avocados, 5 tablespoons raw cacao powder and 6 tablespoons honey. Add gelatin mixture and blend on high until all the ingredients are completely incorporated and the mixture is smooth. Divide into two small serving dishes and refrigerate for at least 30 minutes. Add 1/4 cup natural cane sugar, 1 tablespoon water and 1/2 teaspoon ground ancho chile powder to a small saucepan. Cook over medium heat, stirring to make sure all the ingredients are wet, until the mixture begins to boil. Allow it to boil for about a minute, then remove from heat, and add 1/8 teaspoon Mexican vanilla extract and 1 tablespoon pepitas. Pour mixture onto a piece of parchment paper on a flat surface and allow to harden. When pudding is set, break up the crackle and sprinkle over the pudding. Serve immediately. This recipe is dairy-free and gluten-free.